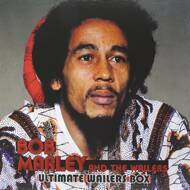 A gorgeous vinyl box set featuring the early '70s recordings of reggae legend Bob Marley performing with The Wailers. These historic recordings include the Lee "Scratch" Perry produced 'Don't Rock My Boat', 'Mr. Brown', 'Soul Rebel', 'Rainbow Country' and much more essential stuff! The set includes extensive liner notes and rare photos in a 12-page full-colour 12x12-inch booklet, as well as four bonus postcards!